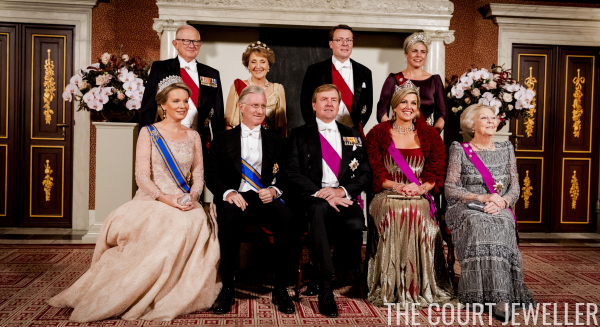 The first day of the Belgian state visit to the Netherlands ended with a glittering state banquet at the Royal Palace in Amsterdam. The best thing about an all-royal state visit? So many tiaras! 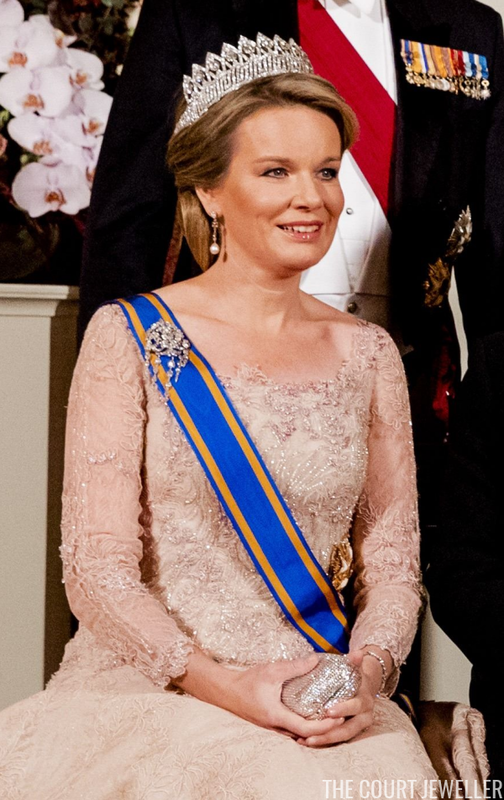 Queen Mathilde wore the full version of the grand tiara of Belgium's queens: the Nine Provinces Tiara. She also wore jewels that belonged to the late Queen Fabiola: her diamond and pearl earrings, as well as her diamond waterfall brooch. We also got a glimpse at a diamond bracelet on her left wrist. 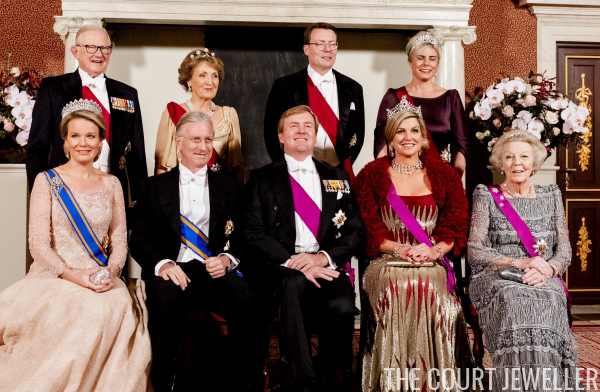 Queen Maxima greeted her guests in the tiara, earrings, necklace, and bracelet from the Mellerio Ruby Parure, a set that has been with the Dutch royal family for more than a century. On her left wrist, she also appears to be wearing Queen Juliana's diamond watch. 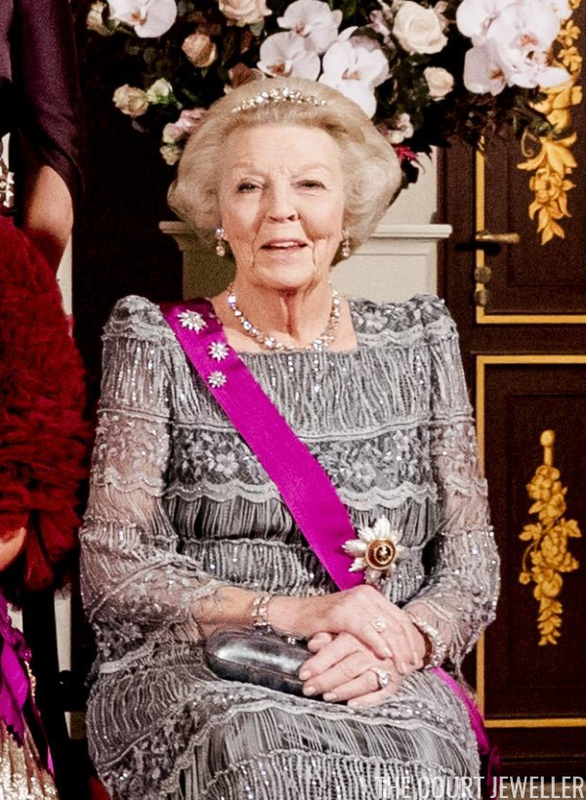 Princess Beatrix chose a tiara we've recently discussed here: the Dutch Diamond Bandeau. She paired it with diamond and pearl earrings, a diamond riviere, and three of the family's diamond stars. We also get glimpses of a pair of bracelets and a pair of rings. 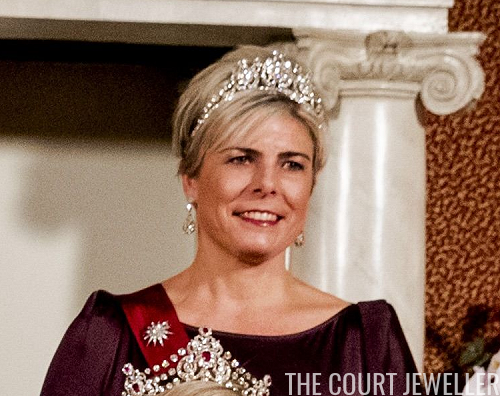 The king's sister-in-law, Princess Laurentien, wore Queen Emma's Diamond Tiara, which Maxima recently wore in New Zealand. She accessorized further with diamond earrings and another of the family's diamond stars. 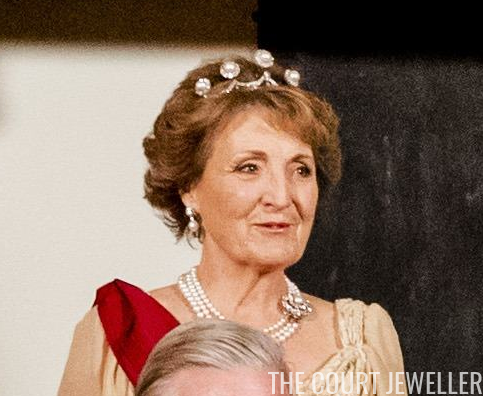 And the king's aunt, Princess Margriet, wore her wedding tiara: the Pearl Button Tiara. She also added pearl earrings and the family's three-stranded pearl necklace with the large pearl and diamond clasp.